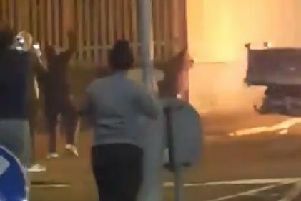 Spectacular footage has emerged showing the collapse of the Sandy Row eleventh night bonfire. The footage was captured and shared on social media by local man, Frank Selby. Eleventh night bonfires are lit the evening before July 12 which is a celebration of the victory of King William of Orange over Catholic King James II at the Battle of the Boyne in 1690. Meanwhile, the Police Service of Northern Ireland have condemned sporadic disorder which occurred in areas of Belfast, Newtownards and Londonderry on Wednesday evening. Assistant Chief Constable Alan Todd said: “The general levels of calls for assistance last night were similar to what we have seen in recent years however we did deal with disorder and disruption which seen 13 vehicles burnt out in Belfast and Newtownards and petrol bombs thrown at my officers in Derry/Londonderry. There were also a number of security alerts. “No part of this is acceptable and today we are looking at the evidential picture to pursue lines of enquiry. “I would like to pay tribute to the job that my officers, along with other emergency services, did last night." He continued: “The disorder we have seen has been caused by a small minority of people who have no regard for their communities. No one wants to see disruption and disorder and the people behind these incidents need to ask themselves just what they are achieving. “I would ask all of those with influence to work with us to ensure the safety of all.